Today is the 6 January and the Feast of the Epiphany. And it means that this post should have been written yesterday to have been done within the 12 days of Christmas. The Feast of the Epiphany in the Roman Catholic calendar celebrates the visit of the Magi to the new-born Jesus Christ in Bethlehem. 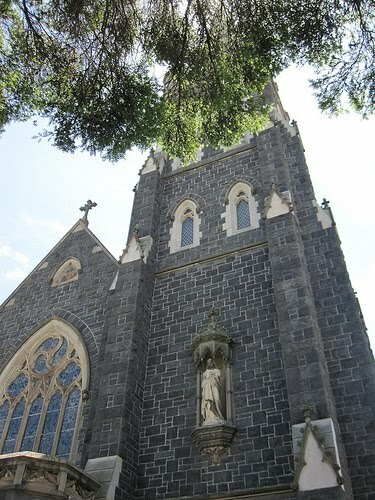 The stained glass window above is to be found in the nave of the Immaculate Conception Church in Burwood Road, Hawthorn - on the eastern side, i.e. on your right as you look towards the altar. The beautiful 19th century glass shines like jewels in the sunlight. In the left hand panel is Mary, seated with the infant on her lap and the approbation of heaven shining down on her. The right hand panel shows the three Magi approaching richly dressed and bearing their gifts of gold, frankincense and myrrh. 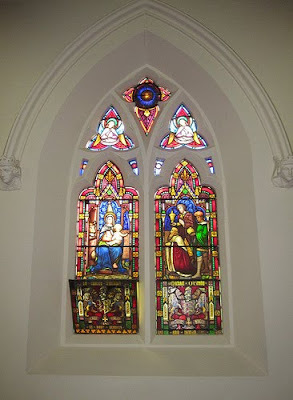 The window is dedicated to parishioner, Michael O'Grady (1824-1876), who was the first Mayor of the municipality of Hawthorn in 1860 when it ceased to be part of the Boroondara Roads Board. 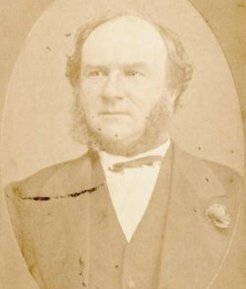 He was Mayor again in 1861/62 and 1870/71 and had previously been Chairman of the Boroondara District Roads Board in 1858. Also local member for South Bourke in the Legislative Assembly with a particular interest in Catholic issues such as the Education Act of 1872, he died suddenly on 5 January 1876 at his home Erinagh in Hawthorn. His requiem mass was attended by many priests and lay people, and the shops in Hawthorn closed as a mark of respect as his funeral cortege moved through Hawthorn on its way to the Boroondara Cemetery. According to the South Bourke Standard, a meeting was held in the parish in August 1870 to decide on which windows would be allocated to those who had subscribed to their creation. Curiously Michael O'Grady was allocated the Visit of the Magi. The date of his death on the eve of the feast of the Epiphany made the subject matter of the window dedicated to him uncannily appropriate. Next time you are going past, stop for a while and visit Immaculate Conception. The stained glass windows have so much to tell us about the history of the area. Happy Epiphany and thanks for the background to the lovely photos. Immaculate Conception, Hawthorn is definitely something to add to the to do in Melbourne list. It's a beautiful church. I will try to post some more stuff about it soon.